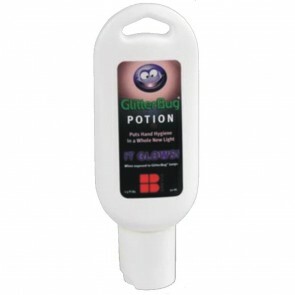 As official UK importers of the Glitterbug product range we supply fluorescent potion and powder in various bottle sizes and in quantities from a single bottle to a case. Click here to see our unique collection of training lamps, cabinets and kits. Teach good handwashing - Magically! 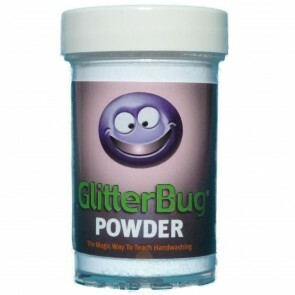 GlitterBug is a product line that makes hand hygiene education interesting, fun, and memorable. 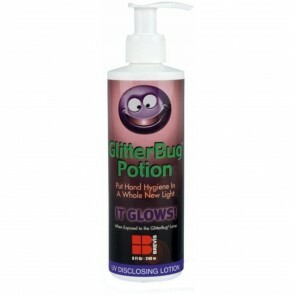 The GlitterBug Potion is a fluorescent lotion that when used with a uv lamp makes it possible to see how well hands are washed. 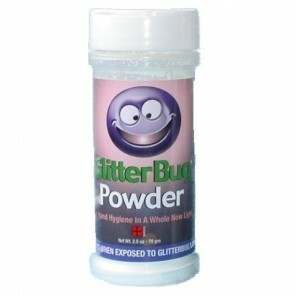 The GlitterBug Powder is used to see how contamination and germs can travel. It is perfect for schools, healthcare professionals and food-handling businesses. 1. Ask the student to rub the potion on their hands. 2. The student washes and dries their hands as normal. 3. When placed under a uv lamp any areas not washed properly will show up - as if by magic! Dust the powder on a sheet of paper and hand it round the room. A check with the uv lamp and you can demonstrate how easily powder (or germs) can be spread from person to person. Alternatively spread the powder on a work surface and ask someone to clean it. Again the uv light will show up any areas that hev been missed.